Wind Power for a Greener L.A.
Today I helped break ground on the Pine Tree Wind Project. When this project is completed, it will be the largest municipally-owned wind farm in the country. Click on the video below to hear more. 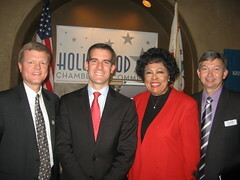 Today I gave my 7th State of Hollywood address, an annual event that has been organized by the Hollywood Chamber of Commerce for many years. You can read the speech on my website, but I'm proud to say that the state of Hollywood is strong and getting stronger through the big dreams and hard work so many people have contributed to our community. Hollywood is a great neighborhood and we have come a long way, but we still have more to do. This year, I want to help make Hollywood safer by expanding a program that I started in Glassell Park. It's called At the Park After Dark, and it keeps parks open until 11 p.m. during the summer so that teens have a safe, supervised place to be. I'm calling on the Hollywood community to help me bring this program to Lemon Grove Park and the Hollywood Rec Center this summer. 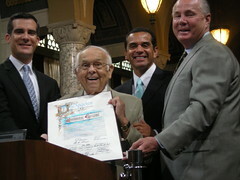 Also, I dedicated this year's address to Johnny Grant, Hollywood's honorary mayor who passed away earlier this month. In a town full of dreams, Johnny had some of the biggest and he worked hard to make them come true. He wouldn't have wanted any of us to just stand on the sidelines, so it's time for us to recommit to realizing our dreams for Hollywood's future. Dakota and Katsuya in Hollywood are just two of the dozens of restaurants participating in dineLA Restaurant Week, which will showcase some of LA's best restaurants. 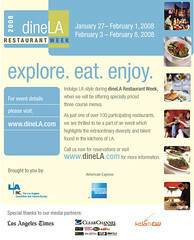 From January 27 to February 1 and February 3 to 8, participating restaurants will offer specially-priced, three-course lunch and dinner menus. If you've been looking for a reason to try out a restaurant, here it is... make your reservation now! 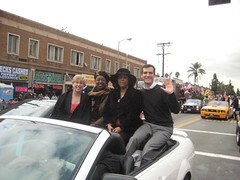 I was proud to honor the legacy of Dr. Martin Luther King Jr. at the 23rd annual Kingdom Day Parade in South Los Angeles. Dr. King is one of the most significant figures in American history and the theme of this year’s parade -- “30 Years of Continuing the Dream” -- plays out every day in Los Angeles neighborhoods where people of all different backgrounds live and work together. As we celebrate Dr. King’s life, let’s all recommit to achieving his dream of equality for all. One in every 88 homes in California are in danger of foreclosure. Fortunately, help is just a phone call away through the Mortgage HOPE Crisis Hotline: 877-592-HOPE (4673). The volunteers at the Mortgage HOPE Crisis Hotline are trained mortgage lending professionals who provide free counseling to help families keep their homes. We want people to call as soon as they think they might need help because the earlier they do, the easier it may be to help them. 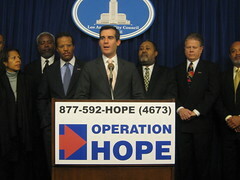 More information about the hotline and other financial education opportunities is also available through Operation HOPE. The Los Angeles Derby Dolls rolled into Historic Filipinotown at the end of 2007 and I'm proud to have these women athletes training and competing in my Council District. In December, the Sirens beat the Fight Crew to win the 2007 championship in one of the most exciting roller derby bouts in League history. The 2008 season opener is next weekend. It'll be fast, furious, and definitely worth checking out. If we’re going to reduce traffic in this city, then people need to have real alternatives to driving a car to work everyday. A few city employees already bike to work, but today we announced new facilities that I hope will make it possible for more people to do so. 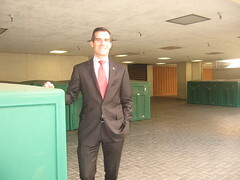 Thanks to our Department of General Services, Personnel Department, Transportation Department, and Helen Leung of my staff, city employees in the Downtown Civic Center area now have access to showers, bicycle and shower lockers, and additional bicycle racks. The Los Angeles County Bicycle Coalition provided assistance with making the new facilities effective for cyclists. I encourage city employees who have ever thought about biking to work to give it a try. It helps reduce traffic. It helps our environment. And it’s great exercise. This morning Hollywood shines a little less brightly. It's greatest star, Johnny Grant, passed away last night. Johnny brought Hollywood the industry and Hollywood the neighborhood together. He was at the center of the story of Hollywood. Johnny not only knew all the players that brought about Hollywood's first golden age, he was one of those participants that made it happen. He was our best booster, our unofficial historian, our neighborhood chairman, and the heart of this town. There was hardly a player in Hollywood over the last seven decades who did not know Johnny. He defined class and commitment to his craft and to his adopted hometown. He was not only part of Hollywood's first golden age, but he stuck with Hollywood when many others abandoned it, and he helped usher in the second golden age that we are now beginning to experience. Johnny's love of Hollywood was mirrored by his unmatched patriotism. Just last month, we honored him for his 60th visit to U.S. troops as the number one USO ambassador. He holds the record for the most visits of any entertainer to our nation's troops, having lifted the morale of our men and women in uniform in every conflict since (and including) World War II. Johnny was a dear, dear friend, and Hollywood and I are devastated by his passing. May Johnny Grant rest in peace.